Good conversation post-debate on the The Keepin’ It 1600 podcast of Bill Simmons The Ringer media venture, which is hosted by Jon Favreau, Tommy Vietor, and Jon Lovett—prominent former aides to President Obama. They are joined by Jessica Yellin (former Chief White House correspondent for CNN) and Tim Miller (former communication head for the Jeb Bush campaign and then lead for anti-Trump opposition group, Our Principles). Nate Silver’s 538 media venture had a great post-debate podcast and additional initial debate reaction. 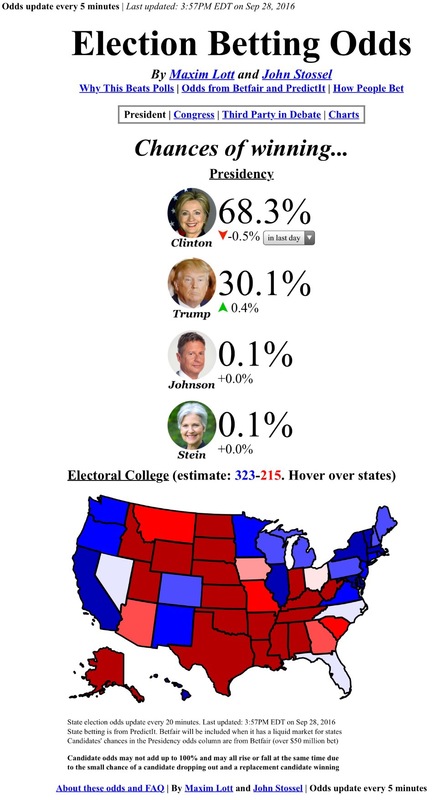 Economist Justin Wolfers points out that prediction markets are bullish on Clinton’s performance. 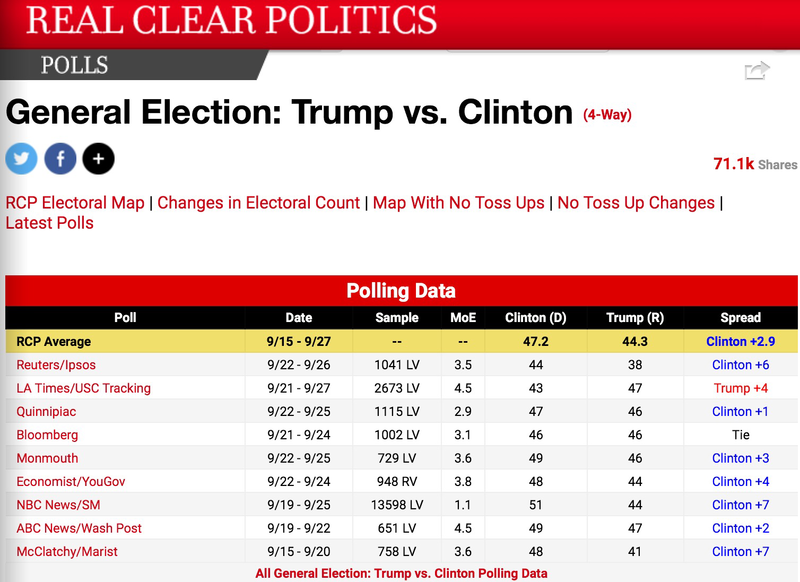 Nate Silver points at early evidence of a post-debate bump for Clinton. 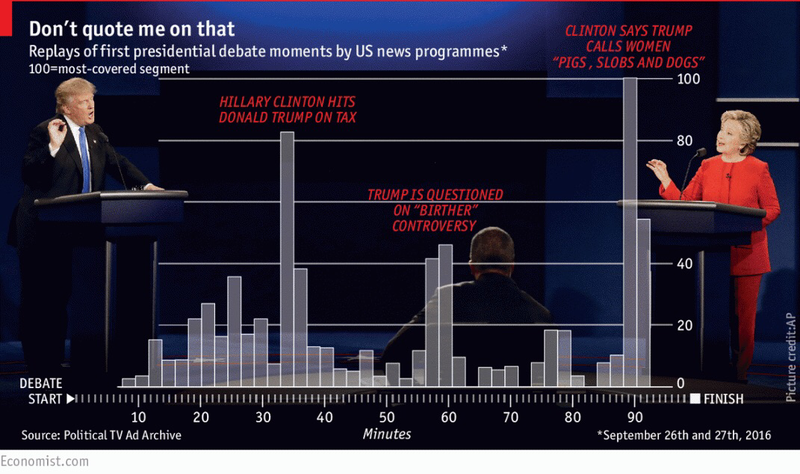 The Economist shares the work of the non-profit group, The Internet Archive, which shows the most replayed segments of the debate in the media—they aren’t high points of Trump (see the graphic below). Via Scott Adams’s Twitter feed (creator of the Dilbert Comic and indispensible thinker on the Trump phenomon), S.E. Cupp and Keith Koffler offer “not-so-fast” accounts suggesting Trump may has done better than many expect. 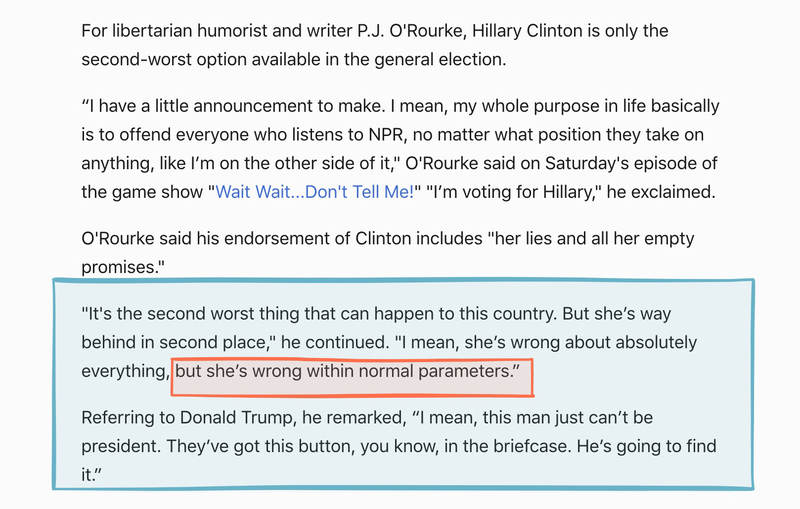 Bill Kristol offers similar remarks, albeit more positive on Clinton. Arthur Brooks questions whether debates matter at all. Notwithstanding where the polls stand, there has been many issues with polling recently: catch-up here, here, and here (read the last link if you read just one). 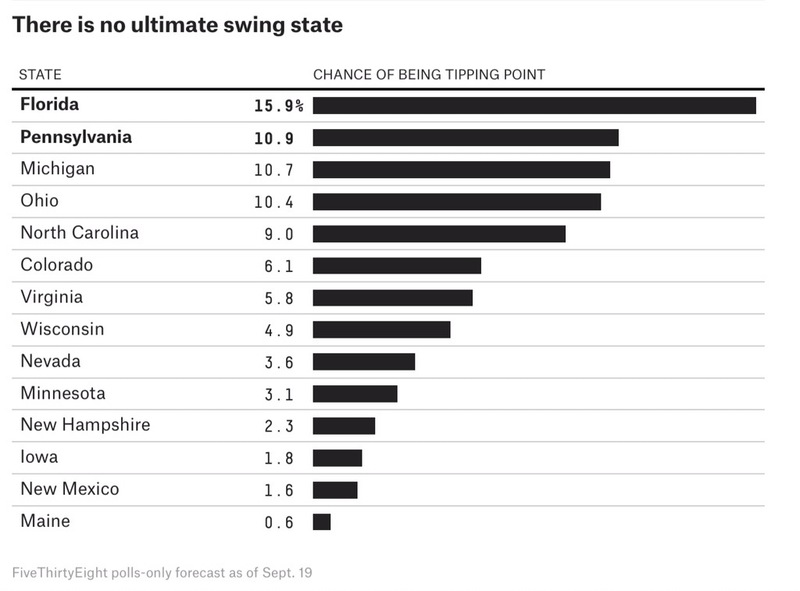 Relatedly, The Upshot gave four seperate pollsters the same poll data—four different takes. Could the “shy-Tory“phenomenon rear its head in U.S. Elections? Along these lines, it’s interesting to catch-up on the roll of data in voter-targeting and turn-out if you haven’t been following. Great AEI event serves as a primmer, video embedded below. It’s impossible to understand modern politics without grasping the data arms race. There are still big questions about turn-out on both sides, but perhaps bigger concerns among the GOP. Dave Wasserman looks at voter enrollment and potential turn-out for 538—he sees potential issues for the GOP . The case for Trump is made in the Claremont Review under the incidiary title “The Flight 93 Election.” Stephen Moore has made the economic policy case for Trump. Responses from the #NeverTrump camp: Conor Friedersdorf, George Will, Jonah Goldberg, Robert Tracinski. In case you you find this all horribly depressing, good remarks from Tyler Cowen.